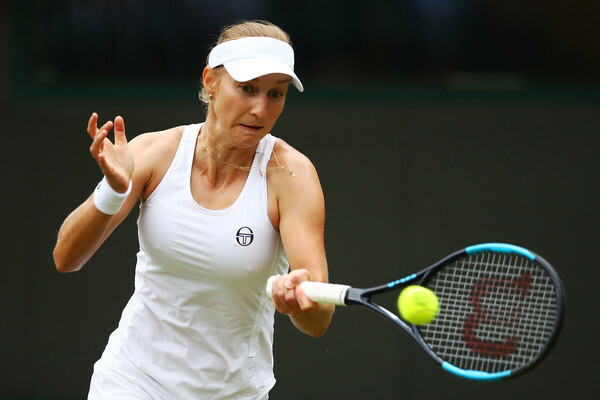 Overcoming a late-match wobble, Ekaterina Makarova shocked world number two Caroline Wozniacki 6-4, 1-6, 7-5 in their highly-anticipated second-round clash at Wimbledon. 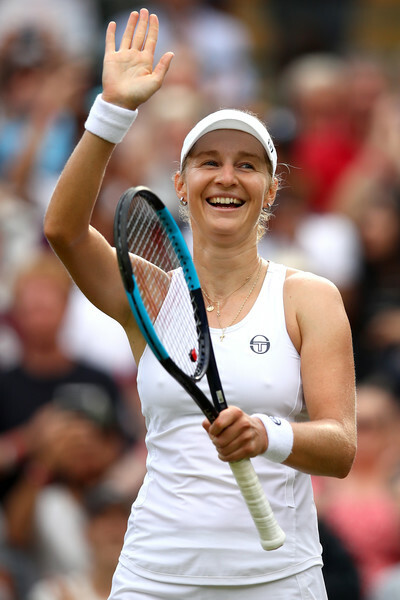 In one of the big-name upsets, which has been everywhere at the 2018 Wimbledon Championships, former top-10 player Ekaterina Makarova found her groove and stunned current world number two Caroline Wozniacki in the second round here at the All England Lawn Tennis and Croquet Club. This was Makarova’s 12th top-10 win at a Grand Slam, the fourth-most among active players coming behind the Williams sisters and Sharapova. Interestingly, this was Makarova’s first back-to-back win of the year and this time glimpses of her vintage form allowed for the Russian to claim the huge 6-4, 1-6, 7-5 victory. The world number 35 was firing on all cylinders, especially on the forehand wing, as she fired countless winners being the more aggressive player on the court to triumph after two-hours and nine minutes. It was an absolutely stunning start from the underdog out on Court No.1 as Makarova claimed eight of the opening nine points within a blink of an eye and jumped out to an early 2-0 lead. The Russian was dictating play and moving Wozniacki all around the court, taking advantage of the fast bounces to outhit her defensive-minded opponent. Nonetheless, the world number two recovered from the slow start and got on board with a confident service hold, before earning a break point with the help of unforced errors by Makarova. Unexpectedly, the former quarterfinalist came up with a beautiful backhand winner followed by an ace to save herself from the brink. In what was the longest game of the match, Makarova fended off three game points before being fifth-time lucky, grabbing her second break by targeting the Wozniacki forehand. She strolled through her following service game to consolidate the break for a formidable 5-1 lead, but nerves seemed to affect the streaky Russian during the most crucial moments. Wozniacki retrieved one of the breaks back but it was not enough to overcome the huge deficit as Makarova capitalized on her second opportunity, closing out the opening set 6-4 after 42 minutes of play. The opening four games of the second set were all extremely tight and were dragged to 30-30. However, all four games were won by Wozniacki as she was calmer and composed on the important points, powering to a commanding 4-0 lead within a blink of an eye. 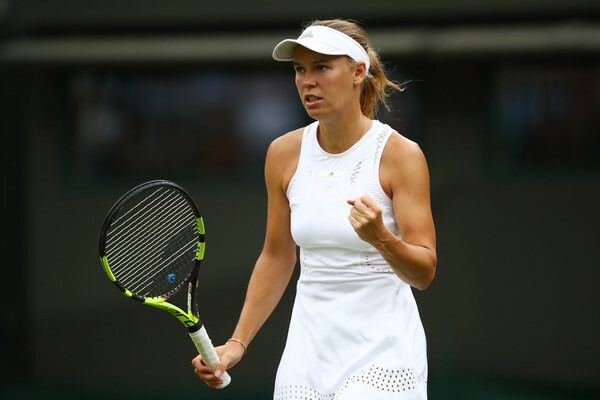 Wozniacki finally found her groove after a slow start and looked comfortable on the grass courts as Makarova’s inconsistency in her game showed up. Makarova failed to display her consistent tennis and she soon found herself trailing 0-5 having won just 10 points compared to Wozniacki’s 23. A spirited service hold then saw the Russian get on board though Wozniacki was just too strong on her serve, taking the second set 6-1 to level the scores. After the disappointing second set, it was the perfect start to the final set for Makarova as the Russian held her serve comfortably before earning a couple of break points in the second game. However, Wozniacki continued to apply the pressure to the world number 35’s backhand and the Dane ultimately earned the tough hold after a tough fight. However, from there, it was one-way traffic for Makarova as she was looking at her best with her forehands working extremely well. She was dictating play and performing excellently with her controlled aggression, opening a stunning 5-1 lead and placing herself just a game away from the win. Makarova’s old habits came back to haunt her once more — struggling at the sight of the finishing line. She became increasingly passive and her increased amount of unforced errors allowed Wozniacki to rattle off four games in a row, recovering from 40-0 down in the tenth game to level the scores from out of nowhere. Makarova produced her first double-fault of the day on match point, before sending an open backhand straight into the net. Wozniacki seemed like the favourite to close out the match after she once again retrieved from a 40-0 deficit to level the 11th game at deuce, though Makarova finally managed to regain her composure and closed out the nervy game with consecutive winners. The Russian learnt from her previous experiences and ultimately sealed the match on a volley winner after 129 minutes of high-quality play.